Our Treatment will leave you with a bright, white smile on your face! Invisalign is a removable orthodontic appliance offered as an alternative to more traditional orthodontic solutions. A type of clear tooth aligner, Invisalign is intended for people who find the idea of a mouthful of metal braces and brackets – however effective – too unattractive to commit to. If you are a candidate for Invisalign or other "invisible braces," you can maintain your smile esthetics while straightening your teeth. Invisalign was introduced in 1999 by Align Technologies. The removable Orthodontics in Pune appliance incorporates a series of invisible (clear) plastic aligners that fit comfortably over your teeth and are designed to move them gradually into the desired orthodontic position. Today, Invisible braces in Pune is a leading brand of orthodontic appliance, primarily because the removable aligners (less than one millimeter thick) are designed to be more esthetically pleasing than conventional wire-and-bracket dental braces for treating certain types of minor misaligned tooth problems. Invisalign aligners are manufactured at the Align Technologies dental laboratory using computer-aided design/computer-aided manufacturing (CAD/CAM) processes. The aligners are sent to the Best dentist in Pune, who typically dispenses them in groups of one or two at a time during regular check-up appointments (about every four to six weeks) so that treatment can be properly managed. Each aligner must be worn in its specific order for about two weeks, during which time it moves the teeth in small increments of about .25 millimeters to .33 millimeters. Although the aligners are removable (for eating, drinking certain beverages and brushing/flossing), they must be worn at least 20 hours a day in order to reposition the teeth successfully. 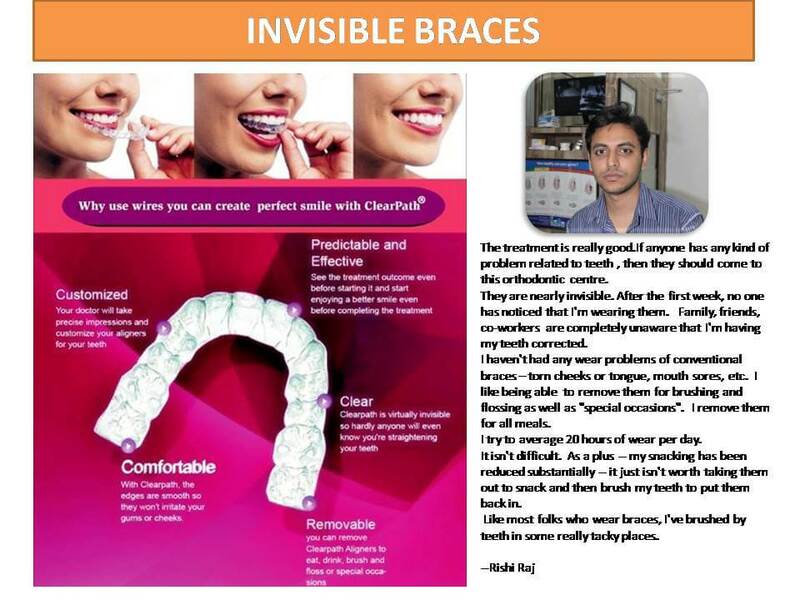 Invisible braces in Pune may not be appropriate for certain cases of misalignment or complex bite problems. 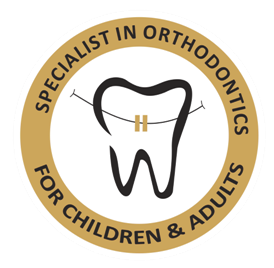 Fixed orthodontic appliances (traditional wire and bracket braces) can be used for complex malocclusions. Though not as esthetically appealing as clear aligners like Invisalign, today's traditional braces have been improved so they are smaller, less visible and more efficient. These newer wire-and-bracket braces also help to correct misalignment much faster than before. •	Crowding and spacing greater than five millimeters. •	Discrepancies involving centric-relation/centric-occlusion (how the upper and lower jaw joints and jaw muscles close together). •	Teeth that are severely rotated. •	Open bites in the front and back of the mouth that need to be closed. •	Teeth that are severely tipped. •	Upper or lower jaws with multiple missing teeth. 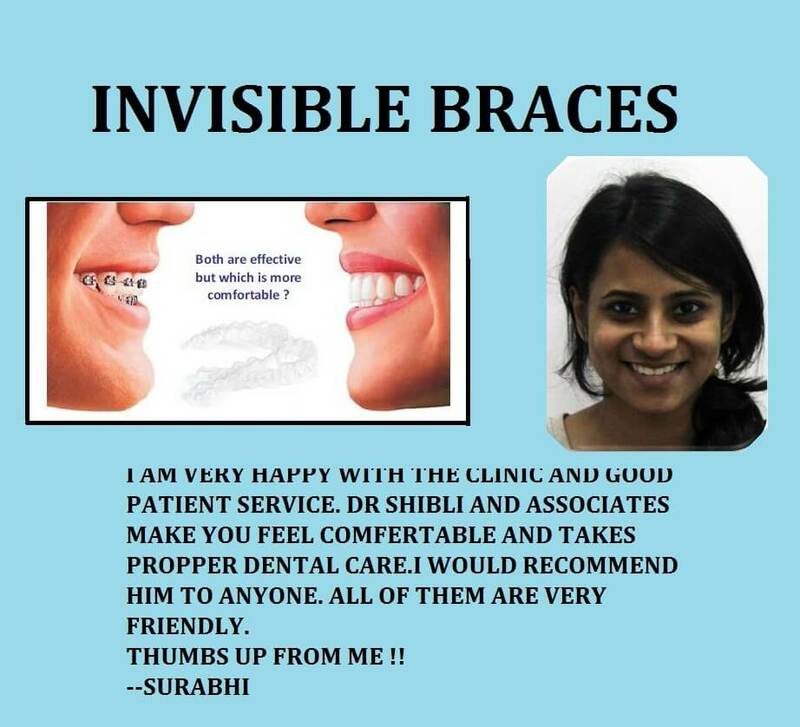 Invisible braces in Pune is currently approved for adults and teenagers with completely erupted permanent teeth who can faithfully follow the directions for treatment – how long they have to wear the aligners each day, what they can and cannot eat and drink, seeing their Best dentist in Pune for follow-up appointments, etc. For example, Dental clinic in Pune recommend that you drink only water while wearing Invisalign trays, to prevent staining of the plastic. If you do not follow treatment recommendations, you may compromise treatment success. •	Overly crowded teeth. When there is not enough room in the jaw for all of the teeth to fit comfortably or normally (one to five millimeters). •	Widely spaced teeth. When there is too much space between the teeth due to abnormal growth of the jaw or shifting of the teeth due to missing teeth (one millimeter to five millimeters). •	Overbite/overjet. When the upper teeth bite over the lower teeth. •	Crossbite. When the upper and lower jaws are misaligned, causing one or more upper teeth to bite on the inside of the lower teeth, on either the front and/or sides of the mouth. •	Mild relapse. After traditional braces have been removed, when some relapsing tooth movement has occurred. •	Invisalign may also be a treatment alternative for certain simple malocclusions (bite irregularities). The cost of Invisalign treatment is comparable to that of traditional braces – ranging from 1.50 to 3 Lakhs. However, only your Good Dentist in Pune can determine the actual cost of treatment because it will be based on your specific needs, including how extensive your dental problems are, how long your Dental treatment in Pune will last, etc. Not all dentists or orthodontic specialists use Invisalign. Align Technologies specially trains dentists to use the aligners. As a patient you get the certificate of quality with the aligners. If your teen needs braces, he or she may just have a reason to smile. The newest addition to the Invisalign product family is Invisalign Teen. Like its clinically proven, FDA-approved predecessor for adults, Invisalign Teen is a series of custom-made, clear plastic aligners that provides a teeth-straightening alternative to more traditional metal braces. Invisalign Teen is designed to help teenagers maintain their self-esteem and self-confidence and accommodate their active lifestyles while they address their orthodontic needs. Developed in collaboration with leading Best Orthodontist in Pune who understand the treatment demands of teenagers, Invisalign Teen combines the benefits of the Invisalign system with new features, such as a Blue Dot Wear Indicator that fades when the aligner becomes worn and is ready to be changed; Eruption Tabs to accommodate the growth of second molars; and other features to address clinical needs common to teens. Invisalign Teen Treatment: What's Involved? Invisalign Teen can be used to correct overly crowded teeth, widely spaced teeth, overbites, crossbites and underbites. Only your Best dentist in Pune or Best Orthodontist in Pune can determine if Invisalign Teen is the right orthodontic treatment for you. After consultation with a specially trained Invisalign Best dentist in Pune, pictures and impressions of the teeth are taken and digitalized. Then, 3D technology is used to map tooth movements from the beginning to end of treatment, forming the basis for creating the customized aligners. On average, treatment takes approximately one year, but every patient's needs are different. The near Invisible braces in Pune Teen aligners are custom-designed based on your Dental treatment in Pune plan to perfectly fit your teeth. Aligners must be worn every day for between 20 and 22 hours, except for when eating, brushing, flossing, playing sports or attending special occasions. During Invisalign Teen treatment, teenagers can keep up their active lifestyle, play sports and smile during social activities. Traditional braces often carry a stigma of being unattractive and noticeable, leaving teens feeling self-conscious and afraid to smile. What's more, traditional wire and bracket braces present challenges for proper brushing and flossing, contributing to food and plaque build-up in the mouth. Because Invisalign Teen aligners are easy to remove, they promote better oral hygiene, as well as a pain-free experience with less irritation to the gums and mouth. The cost for Invisalign Teen treatment is approximately One and a half to two lakhs which is about the same as the cost for traditional braces. However, treatment costs vary from patient to patient, and depending on geographic location. Q1: What is the cost of Invisalign®? A: Invisalign® costs are often three to four times the price of traditional wire braces. Roughly around one to three lakhs.However the prices may vary depending upon the malalignment of your teeth, the length of the treatment and the number of aligners required. Q2:Will other people be able to see my Invisalign® aligners? Q3: Can you see the aligners? A: Until you tell people, they won’t usually notice your aligners at all. People might notice that something is slightly off, as wearing bits of plastic around your teeth isn’t exactly natural, but the more you get used to them, the easier it is to hide them. A: Aligners needs to be changed every two weeks, and every time you shift on to the new aligner you may experience slight headache and sore pain for a couple of days. Always put on the new aligner at night before you go to bed so you’re not faced with a day of achey teeth. That way your teeth will shift into place when you’re asleep! Crispy, crunchy food is always a no-no for me during those few days! Q5: How long do you have to wear them? A: You may have to wear your Invisalign aligners for nearly two years. Daily, you are recommended to wear them for 20-22 hours. This leaves enough time to take them out to eat. You wear them at night whilst sleeping, and throughout the day. Q6: How often will I have to go to the dentist? A: We recommend our patients to visit us every 6 weeks. This allows usto check the progress, as well as perform any necessary procedures, such as IPR (or inter-dental filing)if necessary. Q7: How does Invisalign® straighten teeth? A: As you progress through the Invisalign® treatment, your teeth will be gently and gradually moved into their ideal position. By utilizing a series of these custom-fit aligners, you will begin to see the position of your teeth shift. Over the course of treatment, the trays are slightly adjusted, bringing you closer to that straight, beautiful smile. Q8.Can I remove my Invisalign® aligners during the treatment process? Q9: Will Invisalign® have an impact on my speech? Q10:How do you eat with them? Are aligners easy to take in and out? It’s easy, you simply take them out! Just keep your case nearby, cover your mouth with tissue (strings of saliva aren’t usually considered attractive..!) and slip them out. You don’t need to head to the bathroom every time you wish to take them in or out. It’s as simple as reaching in and popping them out. People wont even notice! Is there anything I’m not allowed to eat or drink? As long as you take your aligners out, you aren’t restricted at all. But if you’re a fan of sugary drinks/alcohol, smoking and chewing gum, this might be a great way to curb your habit, as they are all no-nos when wearing your aligners. We recommend that patients only drink cold water when the trays are in. Occasionally a patient can drink from a straw when they are drinking anything other than water, but it should always be cold to prevent distortion of the trays. It’s suggested that you clean your aligners daily with lukewarm water. I’ve found adding a small amount of toothpaste and brushing them like my own teeth does the perfect job, and leaves them minty fresh! And please do remember to put them in the case when you’re not using them. Always keep them at the room temperature. Do not keep them for a long time in your car , if it is parked in sunlight. How often will I have to brush my teeth? You’re told to brush your teeth at normal times – so in the morning and before bed. What if I lose a set? Immediately put in your last set of aligners & inform your orthodontist. Make sure to keep even your last used aligner safe, as you never know when you might need them! Although the length of your treatment will vary depending on your individual case, most of our adult patients complete the treatment within 12-24 months. For patients using Invisalign Teen®, the growth of their permanent teeth will also affect the treatment time.